On August 17, 1907, Theodore French, a young aeronaut from New Haven, Connecticut, was scheduled to give a parachute performance at Savin Rock in West Haven. Three weeks earlier, he’d accepted a dare to go up in a balloon and be shot out of a seven-foot long tin “cannon”, and parachute to the ground. On that occasion he landed safely. On this day the performance was to be repeated, but with a slight change. This time, the cannon would drop away from the balloon, it’s descent slowed by a parachute. Then, as the cannon floated towards the ground, French would be shoot out of it, and land via use of a second parachute attached to his body. 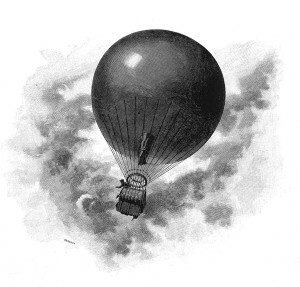 When the balloon had reached a height of about 2,600 feet the cannon was cut loose, and reportedly “swung clumsily” before French was discharged. Once free of the cannon, French’s parachute failed to open, and he plummeted downward landing on the roof of a nearby piano factory and was killed instantly. The cannon came down a few feet away. It was reported that Theodore’s father, Robert French, was the Chief of Police in New Haven, Connecticut. Some sources put Theodore’s age at 19, others at 20. New York Times, “Half-Mile Fall From Sky Kills Boy”, August 18, 1907.